FLAGS WILL BE FLYING SOON! Flags Above Hopkinton is gearing up for the 2019 season. Starting Memorial Day weekend, Rotary volunteers will be at work setting up over 300 flags across town! 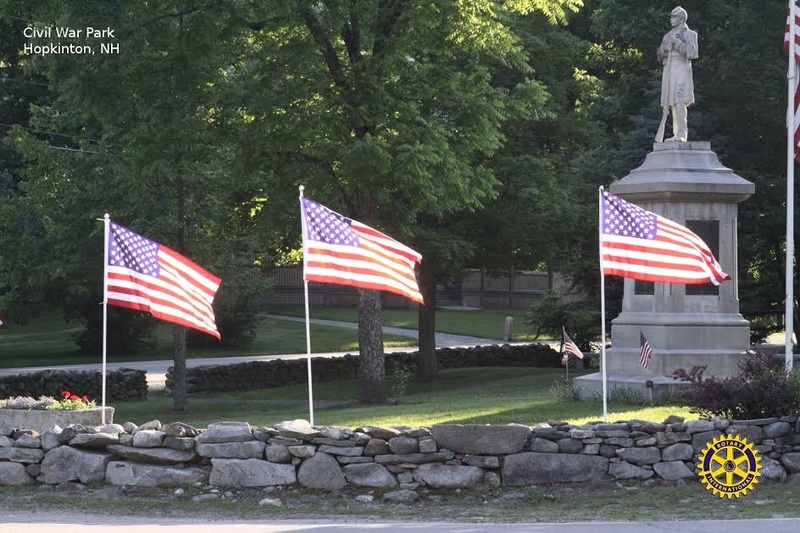 Preparations are underway for the reappearance of Flags over Hopkinton. The flags' first unfurling will be Memorial Day weekend, followed closely by Flag Day and July 4th. The season continues for Labor Day and Veteran's Day. For those of you who have had a flag in the past, we will send a reminder notice but you can get a jump start by sending your check for $40 to Hopkinton Rotary, PO Box 243, Contoocook, NH 03229. If you are new to the program, send your check, along with your street address and any special instructions. Our volunteers will erect the flag near your mailbox unless you direct us otherwise. Proceeds from the flag program support local community efforts, chief among them are the Town's Fuel Assistance Program, Got Lunch, Team Ozram, the Interact Club and our Youth Exchange Program.